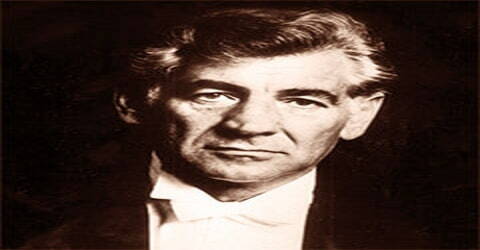 Leonard Bernstein – American composer, conductor, author, music lecturer, and pianist. Place of Birth: Lawrence, Massachusetts, U.S.
Bernstein’s fame derived from his long tenure as the music director of the New York Philharmonic, from his conducting of concerts with most of the world’s leading orchestras, and from his music for West Side Story, Peter Pan, Candide, Wonderful Town, On the Town, On the Waterfront, his Mass, and a range of other compositions, including three symphonies and many shorter chamber and solo works. 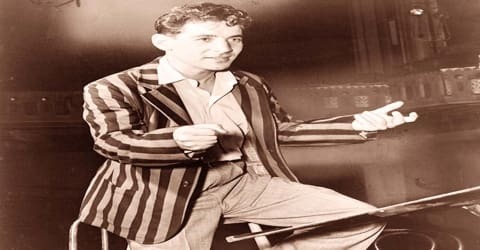 An influential teacher, a brilliant conductor, a fine composer, and an accomplished pianist, Leonard Bernstein was a musician of rare talent who wowed his young fans with his flamboyant style and pedagogic flair. In fact, he was the most dominant classical musician of his times who influenced the music scene of his day more than his peers did. As said by one of the veterans, “When he gets up on the podium, he makes me remember why I wanted to become a musician.” No 20th-century musician had an as towering yet controversial career as Leonard Bernstein. His contribution to the realms of music is indeed unsurpassable. Flamboyant, inspired and voracious in his conducting style, Bernstein got his big break conducting the New York Philharmonic in 1943. He was one of the first American-born conductors to lead world-class orchestras. He composed the score for the musical West Side Story. He was the first conductor to give a series of television lectures on classical music, starting in 1954 and continuing until his death. He was a skilled pianist, often conducting piano concertos from the keyboard. He was also a critical figure in the modern revival of the music of Gustav Mahler, the composer he was most passionately interested in. As a composer, he wrote in many styles encompassing symphonic and orchestral music, ballet, film and theatre music, choral works, opera, chamber music and pieces for the piano. Many of his works are regularly performed around the world, although none has matched the tremendous popular and critical success of West Side Story. Bernstein’s music was deeply inspired by the people of America. No other musician succeeded in arresting the attention of entire America as much as Bernstein did with his television shows. His musical concerts were not only appeasing to the ears but were an inspiration for every mind. Even after he passed away after a long battle with emphysema, at the age of 72, his works still continue to remain popular and are performed all over the world. 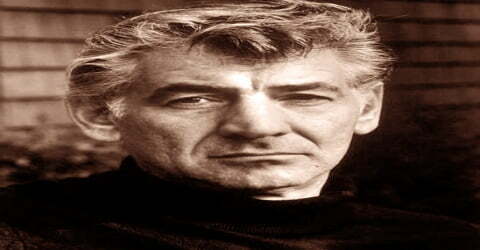 Leonard Bernstein was born in Lawrence, Massachusetts on 25 August 1918, the son of Ukrainian Jewish parents Jennie (née Resnick) and Samuel Joseph Bernstein, a hairdressing supplies wholesaler originating from Rivne (now Ukraine). His birth name was Louis thought it was renamed to Leonard at the age of 16. A shy and sickly child, Louis Bernstein fell in love with music after a relative gave his family an old, weathered upright piano. He began taking piano lessons and changed his name to Leonard at the age of sixteen. Most of Bernstein’s childhood was spent doing odd jobs like mopping floors and stocking wigs for a dealer. Still, from an early age, he went to orchestral concerts and piano performances which immensely captivated him. When his family acquired his cousin’s unwanted piano, he started learning the piano more seriously. Slowly, he began playing entire operas or Beethoven symphonies along with his younger sister, Shirley. The family soon moved to Boston, Massachusetts, where Leonard studied at Boston Latin School. 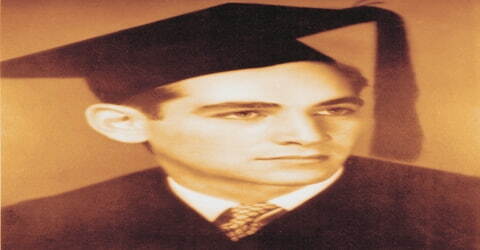 He excelled in academics and graduated in 1935. 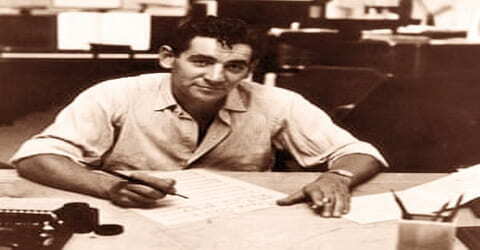 After graduation from Boston Latin School in 1935, Bernstein attended Harvard University, where he studied music with, among others, Edward Burlingame Hill and Walter Piston. Although he majored in music with a final year thesis (1939) entitled “The Absorption of Race Elements into American Music” (reproduced in his book Findings), Bernstein’s main intellectual influence at Harvard was probably the aesthetics Professor David Prall, whose multidisciplinary outlook on the arts Bernstein shared for the rest of his life. The following summer, at the Berkshire Music Festival, he met Serge Koussevitsky, who was to be his chief mentor (teacher) during his early years. During his time at Harvard, he was briefly an accompanist for the Harvard Glee Club. Bernstein also mounted a student production of The Cradle Will Rock, directing its action from the piano as the composer Marc Blitzstein had done at the premiere. Blitzstein, who heard about the production, subsequently became a friend and influence (both musically and politically) on Bernstein. In 1939, after completing his graduation, Bernstein went to study at the Curtis Institute of Music, which was situated in Philadelphia. Here, he started studying and practicing with prominent conductors like Fritz Reiner and pianists like Isabelle Vengerova. Over the time he spent here, he is said to have greatly enjoyed the environment in this Institute. Though there were rumors about his bisexuality, Leonard Bernstein married a Chilean-born American actress Felicia Cohn Montealegre on 10 September 1951. He had three children- Jamie, Alexander, and Nina. In a book released in October 2013, The Leonard Bernstein Letters, his wife acknowledges his homosexuality. Felicia writes: “you are a homosexual and may never change you don’t admit to the possibility of a double life, but if your peace of mind, your health, your whole nervous system depend on a certain sexual pattern what can you do?” Arthur Laurents (Bernstein’s collaborator in West Side Story) said that Bernstein was “a gay man who got married. He wasn’t conflicted about it at all. He was just gay.” Shirley Rhoades Perle, another friend of Bernstein, said that she thought “he required men sexually and women emotionally.” But the early years of his marriage seem to have been happy, and no one has suggested Bernstein and his wife did not love each other. There are reports, though, that Bernstein did sometimes have brief extramarital liaisons with young men, which several family friends have said his wife knew about. 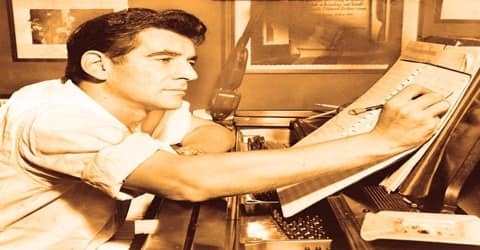 A major period of upheaval in Bernstein’s personal life began in 1976 when he decided that he could no longer conceal his homosexuality and he left his wife Felicia for a period to live with the musical director of the classical music radio station KKHI-FM in San Francisco, Tom Cothran. The next year Felicia was diagnosed with lung cancer and eventually, Bernstein moved back in with her and cared for her until she died on June 16, 1978. In 1940, when Bernstein was 22, the Berkshire Music Center at Tanglewood invited Bernstein to join some 300 other talented students and professional musicians for a summer of musical exploration and performance. Leonard was one of only five students accepted in the master class in conducting that was taught by the fame, Serge Koussevitzky. The man became a father figure to Lenny, encouraging his belief in the power and importance of music. In 1943 Bernstein was appointed assistant conductor of the New York Philharmonic; the first signal of his forthcoming success came on November 14, 1943, when he was summoned unexpectedly to substitute for the conductor Bruno Walter. His technical self-assurance under difficult circumstances and his interpretive excellence made an immediate impression and marked the beginning of a brilliant career. He subsequently conducted the New York City Center orchestra (1945–47) and appeared as guest conductor in the United States, Europe, and Israel. In addition to becoming known as a conductor, Bernstein also emerged as a composer in the same period. In January 1944 he conducted the premiere of his Jeremiah Symphony in Pittsburgh. His score to the ballet Fancy-Free choreographed by Jerome Robbins opened in New York in April 1944 and this was later developed into the musical On the Town with lyrics by Comden and Green that opened on Broadway in December 1944. From 1945, Bernstein started conducting the New York orchestra and appearing as well, as a guest conductor across the United States. During the next few years, his career started to blossom, and he went on several international tours in order to perform. His overseas debut started with the Czech Philharmonic in Prague. After the war (World War II), Bernstein’s career on the international stage began to flourish. 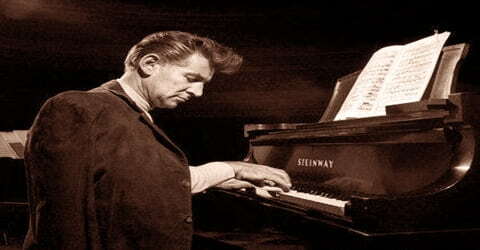 In 1946, he made his overseas debut with the Czech Philharmonic in Prague. He also recorded Ravel’s Piano Concerto in G as soloist and conductor with the Philharmonia Orchestra. On July 4, 1946, Bernstein conducted the European premiere of Fancy-Free with the Ballet Theatre at the Royal Opera House in London. In 1946, he conducted opera for the first time, with the American première at Tanglewood of Benjamin Britten’s Peter Grimes, which had been a Koussevitzky commission. That same year, Arturo Toscanini invited Bernstein to guest conduct two concerts with the NBC Symphony Orchestra, one of which again featured Bernstein as soloist in the Ravel concerto. Despite his great talents, rumors about his sexuality became rampant. His mentor Mitropoulos advised him to marry, believing that doing so would quash the speculations and secure his career. In 1951, Bernstein married the Chilean actress Felicia Cohn Montealegre. Although friends and colleagues always said Bernstein loved his wife, with whom he had three children, he continued to engage in extramarital liaisons with young men. In that same year, he wrote the musical Trouble in Tahiti (1951), a 45-minute two-character chamber piece about a bored, upper-middle-class couple. On December 10, 1949, he made his first television appearance as a conductor with the Boston Symphony Orchestra at Carnegie Hall. The concert, which also included an address by Eleanor Roosevelt, celebrated the one-year anniversary of the United Nations General Assembly’s ratification of the Universal Declaration of Human Rights and included the premiere of Aaron Copland’s “Preamble” with Sir Laurence Olivier narrating text from the UN Charter. The concert was televised by NBC Television Network. In 1949, he conducted the world premiere of the famous Turangalila-Symphony, which was composed by Oliver Messiaen, with the Boston Symphony Orchestra. With less than 24 hours’ notice and no rehearsal, Bernstein substituted for the sick Bruno Walter (1876–1962) at Carnegie Hall and led the Philharmonic through a difficult program that he had barely studied. By the concert’s end, the audience knew it had witnessed the debut of a born conductor. The New York Times ran a front-page story the following morning, and Bernstein’s career as a public figure had begun. During the next few years he was guest conductor of every major orchestra in the United States until, in 1958, he became music director of the New York Philharmonic. In 1953 Bernstein became the first American to conduct at La Scala in Milan. From 1958 to 1969 Bernstein was a conductor and musical director of the New York Philharmonic, becoming the first American-born holder of those posts. With this orchestra, he made several international tours in Latin America, Europe, the Soviet Union, and Japan. His popularity increased through his appearances not only as conductor and pianist but also as a commentator and entertainer. Bernstein explained classical music to young listeners on such television shows as Omnibus and Young People’s Concerts. After 1969 he continued to write music and to perform as a guest conductor with several symphonies throughout the world. His career might have filled several average lives. It is surprising that one who had never given a solo recital (performance) would be recognized as a pianist. Nevertheless, he was recognized as such from his appearances as conductor-pianist in performances of Mozart concertos and the Ravel Concerto in G.
In 1954, Bernstein started the television show ‘Omnibus’. It allowed him to speak to his audience and music lovers more easily. He gave lectures on Omnibus for several years, which were made into a DVD set in 2010. Later, though he stepped down from the New York Philharmonic, he still continued to appear with them for many years till his death. He also toured with them for many years to places like Europe and Asia. His musical life continued to blossom, taking him on several international tours during the 1950s. In 1952, he founded the Creative Arts Festival at Brandeis University. He also found a love for teaching. Bernstein was a visiting music professor from 1951 to 1956 at Brandeis University, and he founded the Creative Arts Festival there in 1952. He conducted various productions at the first festival, including the premiere of his opera Trouble in Tahiti and Blitzstein’s English version of Kurt Weill’s Threepenny Opera. The festival was renamed after him in 2005, becoming the Leonard Bernstein Festival of the Creative Arts. In 1953 he was the first American conductor to appear at La Scala in Milan, conducting Maria Callas in Cherubini’s Medea. Always a fan of both classical and pop music, Bernstein wrote his first operetta, Candide in 1956. His second work for the stage was a collaboration with Jerome Robbins, Arthur Laurents, and Stephen Sondheim, the beloved musical West Side Story. When it opened, the show garnered unanimous rave reviews, matched only by its movie version released in 1961. In 1960 Bernstein also made his first commercial recording of a Mahler symphony (the Fourth) and over the next seven years, he made the first complete cycle of recordings of all nine of Mahler’s completed symphonies. The success of these recordings, along with Bernstein’s concert performances and television talks, was an important, if not vital, part of the revival of interest in Mahler in the 1960s, especially in the U.S. Bernstein claimed that he identified with the works on a personal level, and once said of the composer: He showered a rain of beauty on this world that has not been equaled since. As a composer, Bernstein was a controversial (open to dispute) figure. His large works, including the symphonies Jeremiah (1943), Age of Anxiety (1949), and Kaddish (1963), are not considered masterpieces. Yet they are skillfully shaped and show his sensitivity to small changes of musical variety. He received more praise for his Broadway musicals. The vivid On the Town (1944) and Wonderful Town (1952) were followed by Candide (1956), which, though not a box-office success, is considered by many to be Bernstein’s most original score. West Side Story (1957) received international praise. Bernstein’s music, with its strong contrasts of violence and tenderness, determines the feeling of the show and contributes to its special place in the history of American musical theater. Bernstein’s role as an educator, in seminars at Brandeis University (1952–1957) and in teaching duties at Tanglewood, should not be overlooked. He found an even larger audience through television, where his animation and distinguished simplicity had an immediate appeal. Two books of essays, Joy of Music (1959) and Infinite Variety of Music (1966), were direct products of television presentations. Bernstein also joined hands with the Vienna Philharmonic Orchestra and conducted nine complete Mahler symphonies with them between the years 1967 and 1976. He also performed with the famous London Symphony Orchestra in Fly Cathedral in 1973, and just a few years later, he was named an Honorary President. His major compositions during the 1970s were his Mass: A Theatre Piece for Singers, Players, and Dancers; his score for the ballet Dybbuk; his orchestral vocal work Songfest; and his U.S. bicentenary musical 1600 Pennsylvania Avenue written with lyrics by Alan Jay Lerner which was his first real theatrical flop, and last original Broadway show. The world premiere of Bernstein’s MASS took place on September 8, 1971. Commissioned by Jacqueline Kennedy for the opening of the John F. Kennedy Center for the Performing Arts in Washington, D.C., it was partly intended as an anti-war statement. In 1973, Bernstein was appointed to the Charles Eliot Norton Chair as Professor of Poetry, in Harvard University. He also delivered six lectures on music, with musical examples played by the Boston Symphony Orchestra. These lectures were televised three years later in 1976. He published a collection of lectures, The Joy of Music (1959); Young People’s Concerts, for Reading and Listening (1962, revised edition 1970); The Infinite Variety of Music (1966); and The Unanswered Question (1976), taken from his Charles Eliot Norton lectures at Harvard University (1973). In 1989 he conducted two historic performances of Ludwig van Beethoven’s Symphony No. 9 in D Minor (1824; Choral), which were held in East and West Berlin to celebrate the fall of the Berlin Wall. In 1990 Bernstein was awarded the Japan Art Association’s Praemium Imperiale prize for music. Bernstein’s final performance, two months before announcing his retirement, was as a conductor at Tanglewood in August 1990, where he played the ‘Four Sea Interludes’ of Benjamin Britten, with the Boston Symphony. Despite health problems, Bernstein continued to tour the world in 1990 before returning to Tanglewood for a concert on August 19. He had first conducted a professional orchestra there in 1940, and this performance, fifty years later, was to be his last. Leonard Bernstein received many honors during and after his lifetime. He was elected to the American Academy of Arts and Letters in 1981 where he was also awarded a gold medal. He also received medals from the Beethoven Society, and from several colleges and universities. For his humanitarian efforts, he received the National Fellowship Award in 1985. In 1990 Bernstein was awarded the Japan Art Association’s Praemium Imperiale prize for music. He used the prize money to establish an organization ‘The Bernstein Education Through the Arts’. On August 25, 2018 (his 100th birthday), Leonard Bernstein was honored with a Google Doodle. 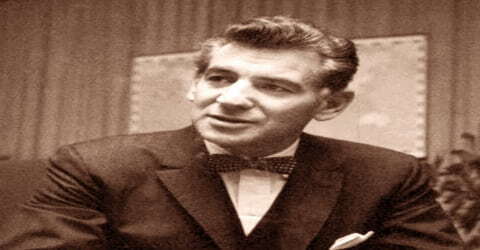 Leonard Bernstein died in New York City, on October 14, 1990, of a heart attack brought on by emphysema (a breathing condition) and other complications. 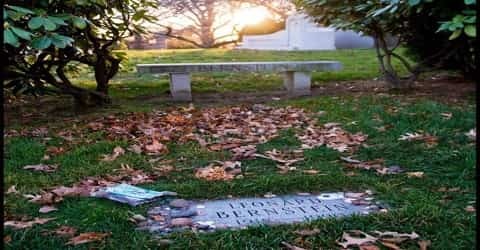 On the day of his funeral procession through the streets of Manhattan, construction workers removed their hats and waved, calling out “Goodbye, Lenny.” Bernstein is buried in Green-Wood Cemetery, Brooklyn, New York, next to his wife and with a copy of Mahler’s Fifth Symphony lying across his heart. While Bernstein was very well known for his music compositions and conducting, he was also known for his outspoken political views and his strong desire to further social change. His first aspirations for social change were made apparent in his producing (as a student) a recently banned opera, The Cradle Will Rock, by Marc Blitzstein, about the disparity between the working and upper class. His first opera, Trouble in Tahiti, was dedicated to Blitzstein and has a strong social theme, criticizing American civilization and suburban upper-class life in particular. As he went on in his career, Bernstein would go on to fight for everything from the influences of “American Music” to the disarming of western nuclear weapons. As a composer Bernstein made skillful use of diverse elements ranging from biblical themes, as in the Symphony No. 1 (1942; also called Jeremiah) and the Chichester Psalms (1965); to jazz rhythms, as in the Symphony No. 2 (1949; The Age of Anxiety), after a poem by W.H. Auden; to Jewish liturgical themes, as in the Symphony No. 3 (1963; Kaddish). His best-known works are the musicals On the Town (1944; filmed 1949), Wonderful Town (1953; filmed 1958), Candide (1956), and the very popular West Side Story (1957; filmed 1961), written in collaboration with Stephen Sondheim and Jerome Robbins. He also wrote the scores for the ballets Fancy-Free (1944), Facsimile (1946), and Dybbuk (1974), and he composed the music for the film On the Waterfront (1954), for which he received an Academy Award nomination. Bernstein’s works were performed several times for Pope John Paul II, including at World Youth Day in Denver on August 14, 1993 (excerpts from MASS), and at the Papal Concert to Commemorate the Shoah on April 7, 1994, with the Royal Philharmonic Orchestra (Chichester Psalms and Symphony No. 3, Kaddish – excerpt) in the Sala Nervi at the Vatican. Both performances were conducted by Gilbert Levine. Although he taught conducting, Bernstein was not a teacher of composition as such, and he has no direct composing heirs. Perhaps the closest are composers like John Adams, who from the 1970s onwards indirectly adopted elements of his eclectic, theatrical style.